- Beautiful outdoor courtyard, tiled with raised gardens, external entrance gate to apartment, BBQ gas point - all ready to setup a second living area and take advantage of our lovely evenings. Residents are spoilt with the enviable facilities including a generous swimming pool, gymnasium, BBQ area and private dining room. Beautifully landscaped gardens will give you space to breathe and relax. Kayak and bicycle hire are available, so you can keep active while exploring the Brisbane River and surrounds. Northshore Hamilton CityCat Terminal is situated directly adjacent to Hamilton Reach, providing transport to the City and beyond. Only a short stroll to Northshore Riverside Cafe and the very popular Eat Street Markets. Also close by are a wide range of retail and dining precincts, including Dendy Cinemas, Portside Wharf and Racecourse Road. Riverlight is all about lifestyle! 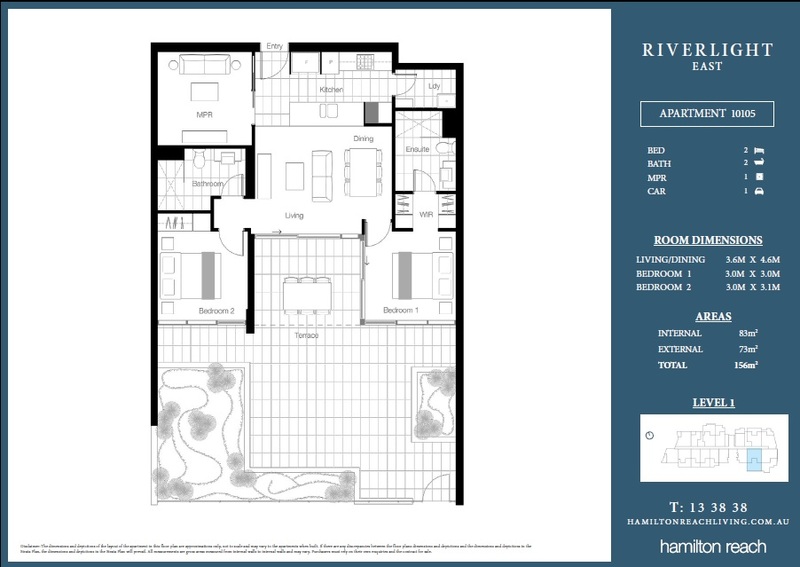 Part of the popular Hamilton Reach community, Riverlight enjoys apartment living with a difference. The building is located in a protected pocket of Hamilton where you're surrounded by riverfront parklands, walking paths, and the precincts very own riverside beach with direct access to the Brisbane River. If you're looking for a premier living community with onsite resident management, then Riverlight is for you! Please contact agent direct on mobile to arrange an inspection of this popular apartment type. Alternatively, simply click on "Email Agent" or the "Book Inspection" button to arrange. By registering, you will be instantly informed of any updates changes or cancellations for your appointment. Otherwise simply pop in at one of our advertised open times.